For years, the historic Downtown Dallas neighborhood between the central business district and Deep Ellum has sat discreetly in the shadow of urban progress and soaring skyscrapers. Now, the area along Cesar Chavez Boulevard, Commerce Street, and Jackson Street is not only getting a slick makeover all its own, it also has a new name: the East Quarter. When the massive redo project is complete, which is projected for year-end, the East Quarter will live up to the song, “Everything Old is New Again”. Through purchases from four property owners, real estate firm Todd Interests added a dozen-and-a-half brick buildings from the 1920s and 1930s to its portfolio along with several vacant construction sites. The crown jewel of the package deal is the landmark Magnolia Oil building that later housed the Dallas Observer and KLIF radio. "This is a neighborhood that's been over 100 years in the making," developer Shawn Todd said during the recent groundbreaking ceremony for the East Quarter, according to the Dallas Morning News. "Some think it's the best-kept secret in our city." Todd and his development partners—a group of institutional investors—immediately hit the ground running and started construction on the first building, which originally contained automotive, equipment, and manufacturing companies. While a portion of the vacant sites will be used to add residential components to the East Quarter, Todd and his partners will redevelop the combined 200,000 square feet of building space into offices and retail and sink around $2 million into spiffy streetscape improvements. 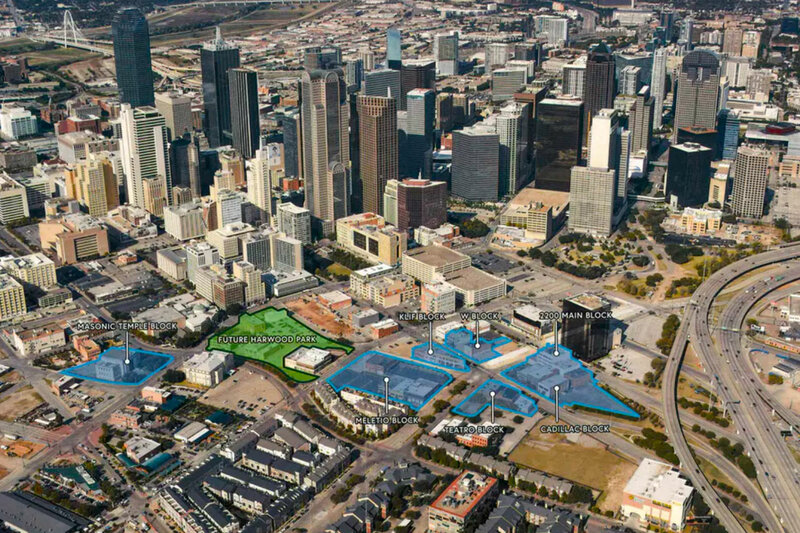 Within a couple of years, the City of Dallas and Parks for Downtown Dallas will begin building the 3.8-acre Harwood Park at Harwood and Jackson Streets, which will add greenspace, a live music stage, pavilions, and adult and kid play areas to the East Quarter landscape. The eclectic vibe of the reborn neighborhood is a prime fit with companies in the creative, technology, and entrepreneurial sectors. Lease space isn’t officially on the market yet, but Todd has already acquired two leases, according to the Dallas Morning News report. After being a tenant in one of the buildings for nearly two decades, marketing company Tractorbeam renewed its lease on 30,000-square-feet of space. And OrderMyGear, an ecommerce software firm, signed a new lease. "We fell in love with these buildings and the history," James Skidmore with OrderMyGear told the Dallas Morning News. "We have 80 people on two floors in the building across the street, and we've been looking for a place to expand. We are super excited to be part of the growth of this area."